GreenRoad bus and truck technology: An ingenious way to help gas-guzzlers save fuel. You don’t need to reinvent buses to help them save gas. This technology rewires their operators instead. 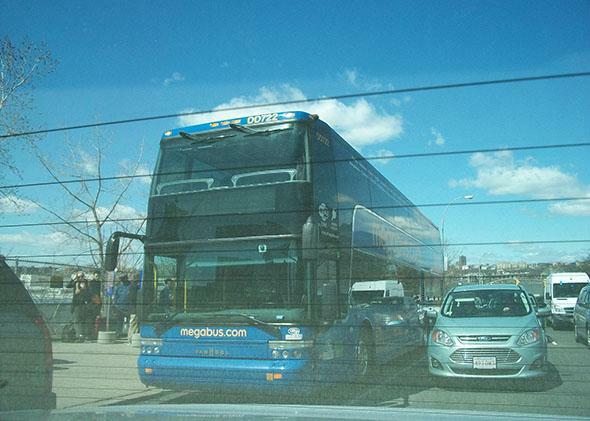 Megabus recently began using GreenRoad technology. Facing high fuel costs and mandates for better mileage, the transportation industry is increasingly focused on technological fixes that offer marginal gains in fuel use, like turning vans into hybrids and replacing steel with aluminum on pickup trucks. But it turns out you don’t need to make huge investments in new equipment in order to boost the efficiency of gas-guzzling vehicles. All you need is a tiny screen with flashing colored lights on your dashboard. That’s the proposition behind GreenRoad, an 11-year-old Israeli company that has signed up large bus and trucking operators as clients, including Megabus in the U.S. and British bus giant Stagecoach. By offering these companies a cheap way to cut their fuel use by 3 percent, GreenRoad is pointing the way toward meaningful gains in decreasing emissions and increasing the mileage of some of the world’s least fuel-efficient vehicles. Like so much of the innovation we see these days, GreenRoad’s technology is pretty cool but also slightly Orwellian. Companies have been using GPS-based telematics for years to monitor where their drivers are, how fast they’re going, and how many coffee breaks they’re taking. GreenRoad kicks telematics up a notch by gathering information on how drivers are maneuvering on the road and offering them subtle prods to do better. Here’s how GreenRoad works. A small unit the size of a matchbox is installed on the dash to the left of the steering wheel. It has three lights: green, yellow, and red. The device is connected to a small onboard computer that measures five types of driving behavior—hard braking, acceleration, land handling, cornering, and speeding. The computer feeds information to the dashboard unit and also sends it to the cloud, where it can be seen by managers at headquarters and later by drivers through apps. If a driver has a bunch of events that indicate poor performance—if he jams on the brakes at a stoplight or takes a corner at a dangerous speed—the light will turn yellow and then red. Cruise along for 10 minutes without an issue, however, it returns to green. The theory, says Braude, relies more on behavioral economics than engineering. Driving is a learned and habitual behavior. In real time, the system alerts drivers to unconscious errors they’re making and prods them to make corrections. Over the course of several days, the conscious corrections become subconscious corrections. “So with time you start behaving much safer,” says Braude. Harnessing the data also allows managers to reward (or punish) drivers. The system spits out daily, weekly, and monthly scorecards, so drivers can see how they’re performing compared with their colleagues. “At the end of the day, it is not a disciplinary tool,” said Braude. It enables companies that use it to set up competitions and rewards programs. Stagecoach, which last year installed GreenRoad’s tech on 1,200 buses in London, lets drivers rack up green points that can be turned into cash. The cost isn’t that high, Braude said: about $40 per vehicle per month. But the savings can add up very quickly. “For every dollar they spend they get $10 back,” Braude says. How? First, there are fuel savings. GreenRoad’s systems have been deployed across large fleets for several years, especially in the U.K. Case studies produced by GreenRoad on British bus operators FirstGroup and Stagecoach showed a reduction in fuel consumption of 5 percent and 4 percent, respectively. But even in our era of muted gas prices, small reductions in use pay big dividends. Megabus, the big intercity bus operator, last month announced that it and its parent company, Coach USA, would target a 3 percent fuel reduction as they roll out GreenRoad on their combined 2,400-vehicle fleet. An intercity bus that drives 150,000 miles per year and gets 5 miles per gallon burns through 30,000 gallons of diesel annually. At a price of $3 per gallon, that’s $90,000 a year in fuel. Reduce that amount by 3 percent, and you save $2,700 per bus, which can add up quickly. If gas prices were to rise, either due to market forces or due to higher fuel taxes, the savings would mount. The monetary savings go beyond lower fuel consumption. When drivers operate their vehicles more carefully, they’re likely to have fewer accidents. GreenRoad says that its clients, on average, see a reduction in the cost of accidents of about 40 percent. Braude notes that one of GreenRoad’s U.S. trucking customers had more than 20 rollovers the year before installing GreenRoad. In the first two years after installing the system, it had none. GreenRoad is now (carefully) accelerating. And it is aiming to make big inroads in the vast U.S. market. In March, the company raised its latest round of venture capital, $26 million. It recently opened a new headquarters in Austin, Texas, where there’s a highway with a speed limit of 85 miles per hour. For GreenRoad, encouraging drivers to cruise at a fuel-optimizing 55 miles per hour on America’s open roads may be the ultimate test.